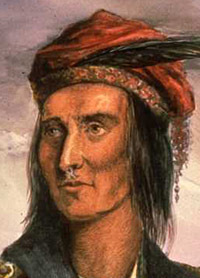 Shawnee chief who lead his warriors against American troops and formed a confederacy of all the western and southern tribes to hold the Ohio river valley as the permanent boundary. In 1812 he was commissioned as a brigadier general by the British. "He was noted for his humane character and success in persuading his tribe to discontinue the practice of torturing prisoners. At the battle of Fort Meigs he saved the American prisoners from massacre." 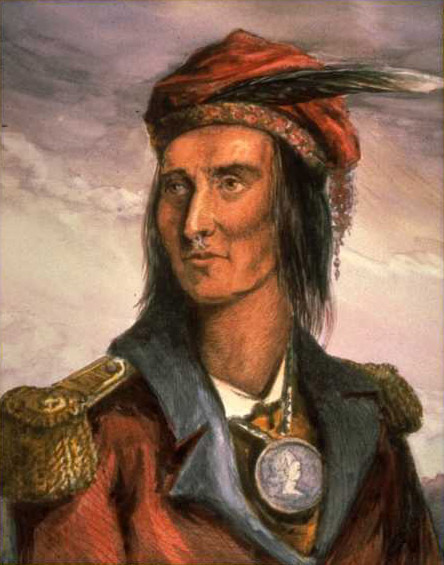 A Past Grand Master of Virginia, Robert G. Scott, before that Grand Lodge in 1845, related an incident "well authenticated, and vouched for by several witnesses now living" wherein Tecumseh, recognizing the cry of a freemason amongst prisoners taken after his victory over a detachment of the Northwestern Army lead by General Winchester, halted their slaughter by his warriors. Source: William R. Denslow, Freemasonry and the American Indian, Missouri Lodge of Research, St. Louis: 1956. pp. 172-74. Portrait uncited. Also see another illustration.